Rockport sells men's and women's footwear retailer. It sells a variety of designer brands that can be worn in casual and formal settings. Consumers like the vast collection of shoes, handbags, and accessories available at Rockport. Get Women’s Real Steals Factory Outlet for styles starting at only $39.98. Get Up to 60% off End Of Season Sale. No code needed. 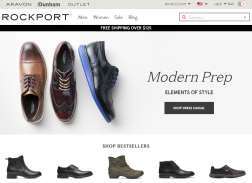 Get Free Standard shipping for a year when you sign up for a Rockport account. Get Up to 50% off EOS Sale. No code needed. Get up to 60% off select extra boots. Get 15% Off your order + Free Shipping when you sign up for email. Applies to new email subscribers only. OUTLET US – EOS Sale! Get Up to 70% off select styles. No code needed.